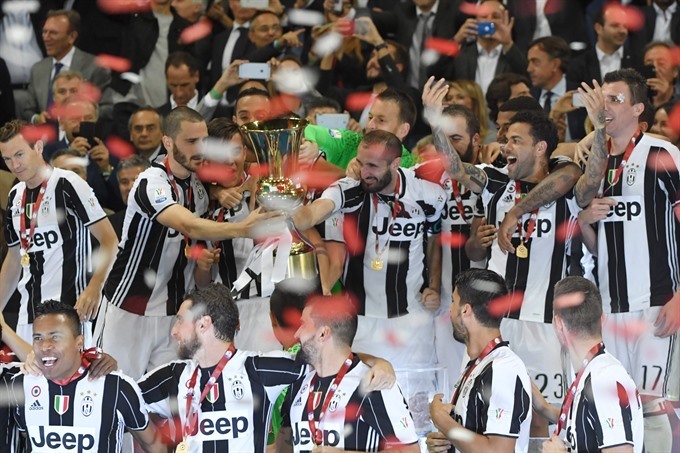 ROME — Dani Alves and Leonardo Bonucci struck one apiece as treble-chasing Juventus secured a record third successive Italian Cup with a 2-0 victory over Lazio at the Stadio Olimpico on Wednesday. Juventus, who won a league and Cup double the past two seasons, can clinch a record sixth consecutive Serie A title -- and a record third double -- with victory at home to Crotone on Sunday. Massimiliano Allegri’s men also face Real Madrid in the Champions League final in Cardiff on June -- and on this showing the Spanish giants will have cause for concern. Days after seeing their title celebrations put on hold at the Stadio Olimpico following a 3-1 defeat to Lazio’s city rivals Roma, Juventus were back their formidable best. Lazio, whose last trophy came from their 2013 Cup triumph, had hoped to emulate Roma by sending Juventus back to Turin with their tails between their legs. But despite a battling display by Simone Inzaghi’s men, Lazio spurned their few chances, and were outplayed by the slick, passing play inspired by Argentinian playmaker Paulo Dybala. The sizeable Lazio support were given hope in the opening minutes when Keita Balde latched on to Sergej Milinkovic-Savic’s smart ball up the left flank to slip past Andrea Barzagli. But the Senegal striker saw his shot from a tight angle, which evaded ’keeper Norberto Neto, given a start ahead of Gianluigi Buffon, come off the post. The scare was enough to jolt Juve into life. Argentina striker Gonzalo Higuain, who went on to spurn several chances to add to Juve’s tally, controlled well outside the area and unleashed a volley that Thomas Strakosha did well to block. Strakosha pulled off an acrobatic save out the bag to stop Paulo Dybala’s long-range effort, the first of many in a performance that underlined the 22-year-old Albanian’s talents. On the quarter-hour, Lazio piled on the pressure, but when Balde’s cross into the area went awry it sent Juventus on a quick counter that left the capital side exposed. Strakosha palmed Dybala’s ferocious strike to safety, and when it fell to Higuain three yards out he kept the Argentina striker’s effort out with his legs. When Lazio were caught deep in Juve territory soon after, it exacted a heavier toll. Dybala struck the corner, Alex Sandro flicked on towards the near post and Bonucci had an easy job tapping past Strakosha from close range. Minutes before the interval, play was waved on when Thomas Rincon was left injured in midfield, and it almost paid off for Lazio when Ciro Immobile sent a header inches past Neto’s upright. Juve resumed in similar fashion, a combination of vertical passes between Dybala and Higuain sending Mario Mandzukic through until the big Croatian came down under a challenge from Wallace. Inzaghi tinkered when he replaced Angolan defender Bastos with Brazilian forward Felipe Anderson, who only seconds later forced a great parry from Neto following an angled snap shot. Anderson was involved again when Lazio edged even closer, collecting Dusan Basta’s smart ball to cross for Immobile at the back post. The striker rode on Chiellini’s back to get his head to the ball, which came off the defender and was somehow kept out by an alert Neto.